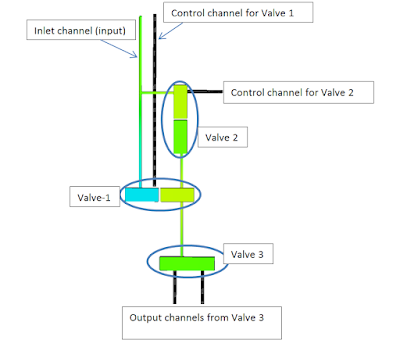 In this final post in the series of Flow Science’s 35th anniversary simulation contest, I will talk about a case study simulating a part of a microfluidic circuit – pneumatic latching valve. These devices are a relatively new industry application that Flow Science is exploring, in the context of a broader exploration of the use of CFD in microfluidics applications, and results have been very encouraging. There have been recent developments in the field of microfluidic circuit devices, also called Lab-on-a chip. These circuits are used in biological sciences to transport matter from one place to another, or to perform hundreds of assays in parallel, based on certain logic. Hence these circuits are also known as microfluidic logic circuits. Analogous to an electronic circuit, the fluid runs through channels and is driven by pressure differentials (as opposed to the traditional potential/voltage differentials in an electronic circuit). Combinations of valves and the application of correct pressures forms logic gates like AND, OR, XNOR, etc. Eventually the combination of these logic gates forms a microprocessor chip that can be used as a positive edge detector, toggle, clock, demultiplexer, etc. 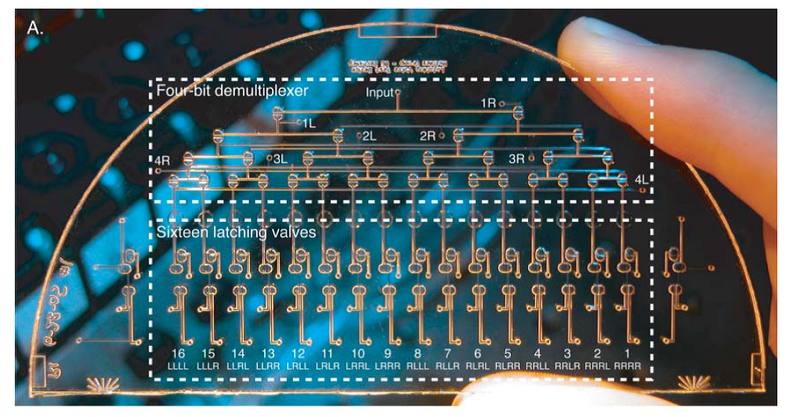 One such example of a 4-bit microfluidic demultiplexer is shown in Figure 1. The demultiplexer has 16 (4-bit implies 16 possible combinations or outputs) pneumatic valves that work in parallel to attain a desired output. Therefore, understanding these latching valves is central to the correct operation of the circuit. CFD simulations can play a vital role in reducing costs by testing the design of these types of circuits before fabrication. Figure 1. A microfluidic 4-bit demultiplexer for routing pressures and vacuum pulses. Inside the red box is a single latching valve that will be simulated in FLOW-3D. A latching valve, as the name indicates, holds (latches) a valve in open/closed position without continuous application of external pressure. Latching valves are used for energy efficiency and are analogous to electrical solenoid valves. Details of the working of a latching valve system are shown in Figure 2. Stages 1-7 show how the system changes from a closed state to a latched open state, and then back to a closed state again. An open state is one where the fluid can flow through the valve, and in a closed state fluid cannot flow through the valve. The latching system primarily comprises of 3 types of features – valves, inlet channels and control channels. Valves and inlet channels are made from solid components in FLOW-3D, while the control channels are directly represented through meshes (seen in black in the figure below). Each valve has an inlet channel and a control channel except for valve 3. Valve 3 has an inlet channel and two output channels. The inlet channel brings in fluid and the control channel allows the pressure to be manually controlled externally by the user/designer. Setup of the entire latching valve system in FLOW-3D is shown in Figure 3. Figure 3. Setup of the latching valve system (currently in stage-7) in FLOW-3D. Being pneumatic valves, the functioning of the latching system is totally dependent on the application of pressures at the boundaries of the system. The inlet boundary condition is a time-varying pressure boundary condition with vacuum (below atmospheric pressure) and pressure pulses (Figure 4). 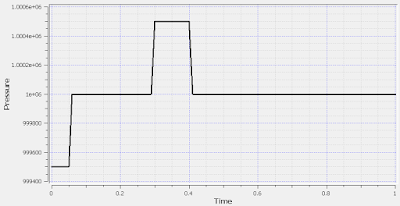 The control channel for valve 1 has a pressure pulse twice the atmospheric pressure (Figure 5). The control channel for valve 2 is maintained at atmospheric pressure. The outlet channel is at atmospheric pressure. Notice that eventually all the pressures fall back to atmospheric pressure, which means that no additional external pressure is required by the latching system to stay in its state (closed in this case). Figure 4. 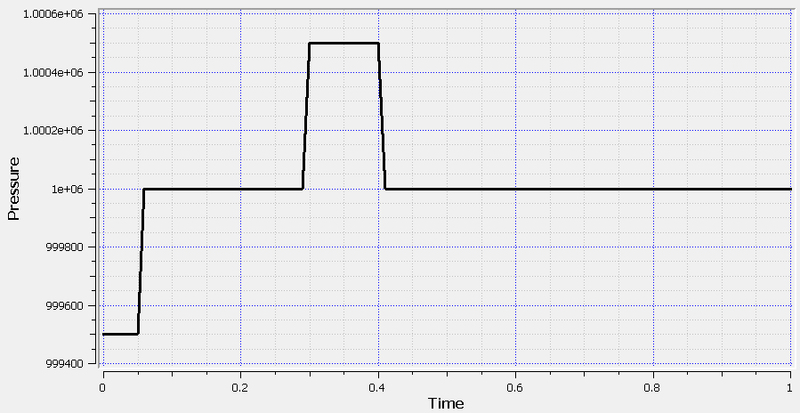 Time-varying pressure boundary condition for the inlet channel to Valve 1. Figure 5. 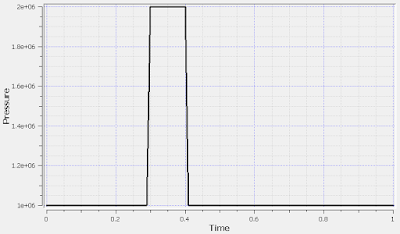 Time-varying pressure boundary condition for the control channel of Valve 1. Stages 3-7 were simulated using FLOW-3D and the results post-processed in FlowSight. The latching mechanism has been accurately simulated, as shown in the reference paper, by starting at the open stage (stage 3) and ending at the closed (stage 7) stage. 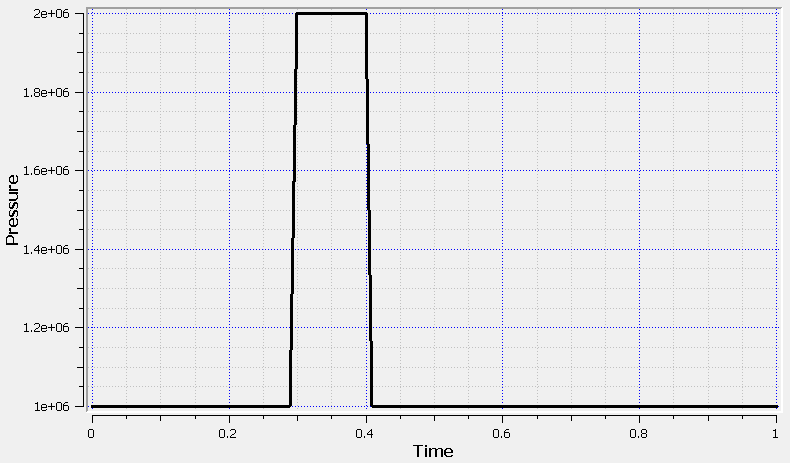 Pressure pulses in the inlet channel are 500 Pa, positive or negative and the pulses span over 50 milliseconds. Water is used as the fluid, and compressibility of water is used to allow some propagation time for the pressures in the system. Opening and closing of the individual valves can be seen in top three viewports of the animation below. The simulation below shows the evolution of the system from stages 3-7. Simulation of a pneumatic latching valve used in microfluidic demultiplexer. The animation starts at stage 3 – the open stage, and finally evolves to stage 7 – the closed stage. 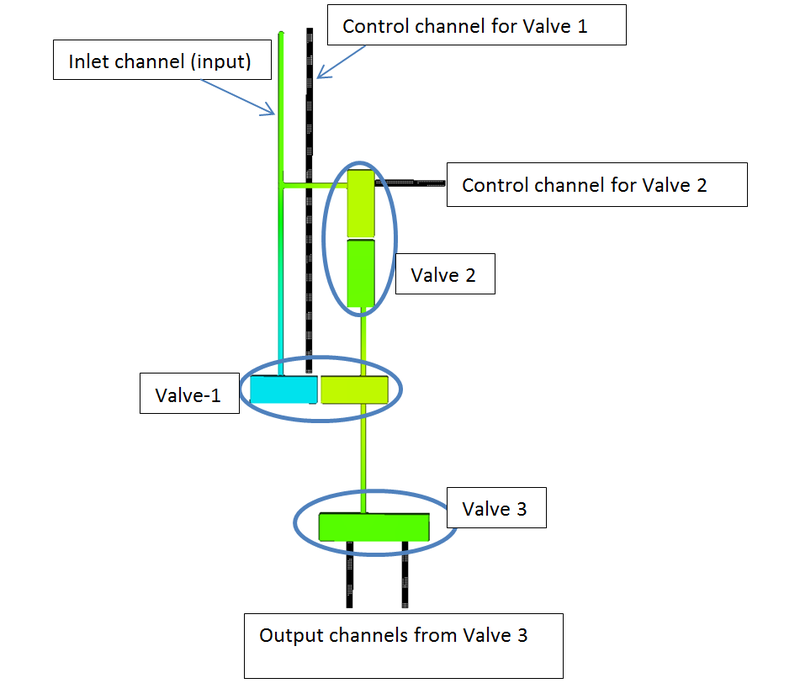 An accurate simulation of the working of the pneumatic latching valve can help designers reduce the cost of trials and errors in the design phase, ensuring that the best design goes to the fabrication stage. Notice that in the final stage, the valves are in a closed state and would remain so for a certain period of time, in spite of the absence of external pressures through control channels. In the upcoming post I will talk about our new optimization and parametric study capabilities using CAESES, an optimization software by Friendship Systems.